You must make reservations at least 5 minutes in advance of the time at Hoof & Vine. Free valet parking available on weekends. 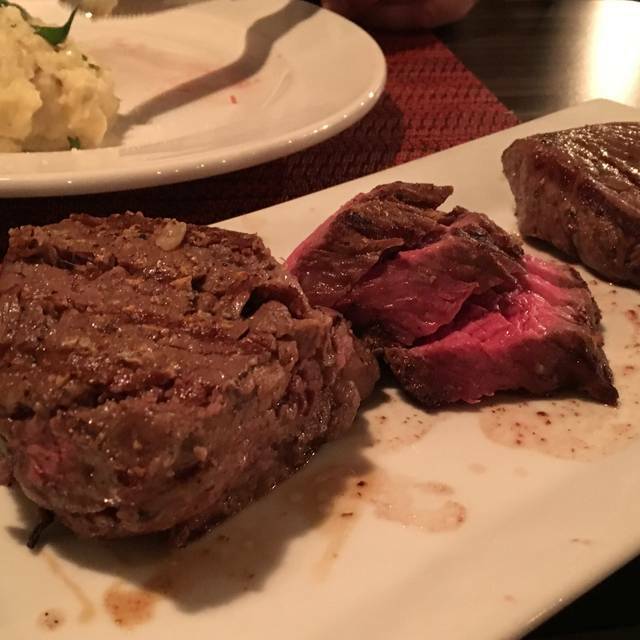 From the owners of Tiburon and The Wild Rose, Hoof & Vine, A Modern American Steakhouse, brings fantastic cuts of beef including American Kobe, American Piedmontese, and Dry Aged Certified Angus. All entrees paired with a starch of your choice, seasonal vegetable, palate cleansing sorbet, our signature house salad, and a bread course. Small plate appetizers and table sides to share will accompany your meal perfectly. Pair your courses with a choice from an extensive wine list or one of the bottled or canned beers from our mouth-watering beer menu. Loving Burger Wednesdays. Hopefully you’ll keep going with them. I have eaten at Hoof and Vine twice and both times the meat was exceptionally tender and lean. As always, they did an excellent job. I know some folks prefer Carvers, or Christopher's, or Ruth Chis or whomever as a favorite. That is fine, I have eaten at all those establishments, but for the dollar and quality, none of those guys compare with Hoof & Vine. The food is the best, the menu is no way limited, the offerings are more than ample. Try it, you'll like. Food and service were excellent. We were given a booth as requested and everything about the meal was excellent. Always a great dinner! We will be back soon. Thanks! We love this restaurant. It can get noisy when it’s full. It’s a simple designed restaurant. 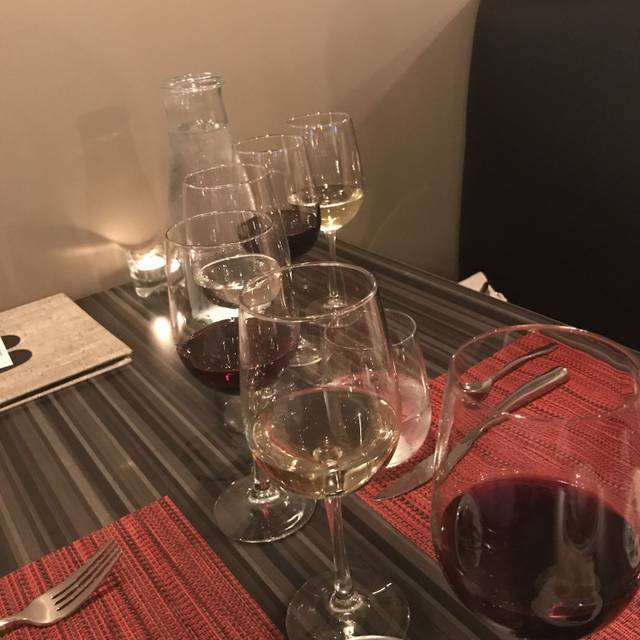 Their wine dinners are wonderful! The chef does a great job with the pairings. We try to make every one. Callie is a great server giving us plenty of time between courses. The steaks are always cooked perfectly. Hubby loves the stroganoff. Hoof and Vine is a hidden treasure. We hope more patrons go there to assure their long-term success. Seriously delicious food. The tenderloin Wellington style is fabulous and their raspberry (pallet cleanser) sorbet, I could eat a bowl full. I love wild rose, and when I found out the two were connected I really wanted to try Hoof & Vine. I got the ribeye and my wife got the filet. My steak was tough and not very flavorful, if I am paying $45 it better have good flavor and texture. I have had better steaks at Texas road house (and they are not the best). 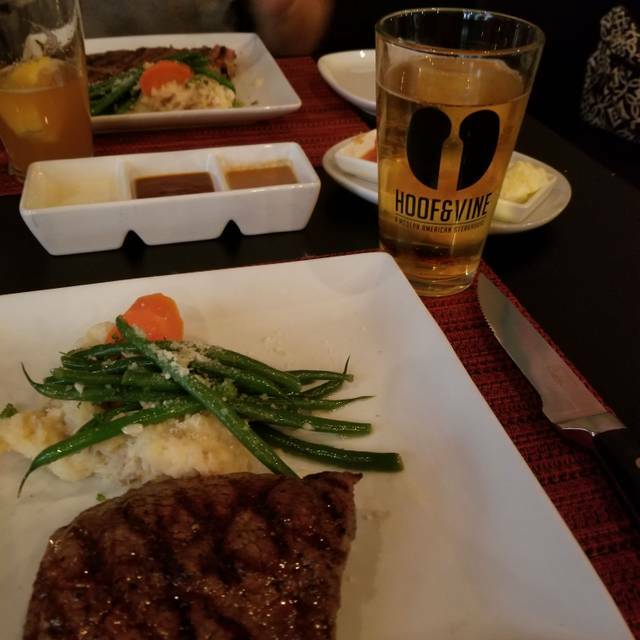 I thought they would be better than Wild rose because they were a dedicated steak house, but my steak didn't even compare to the ribeye at wild rose. Brussel sprouts were great as appetizer, thats the only reason I didn't say poor in food. Please save you time and money and go somewhere else for a good steak. Been here many times and always have a nice dinner. Pleasant service and great steak! I highly recommend Wellington style because the mushroom duxelle puff pastry is killer good! My server even gave me a VIP card for when I return on business. ambiance was not very good. Table and chairs reminded me of a diner. Food was outstanding. Atmosphere was perfect. Staff was extremely knowledgeable and attentive. Perfect evening for our anniversary. Great food great service. Really fun time with friends! We tried it for the first time and we were pleasantly surprised!!! Our food was fantastic! We plan to go back soon!!!! Wine pairing dinners continue to be outstanding. Service and food quality were excellent. My complements to the chef and staff. I love this place. 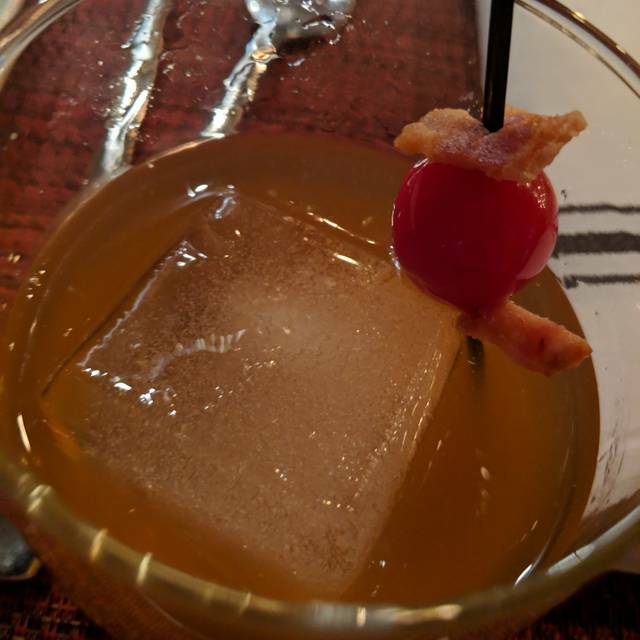 The food is amazing and the Georgia Sour is my new favorite drink. The house salad is so good and their homemade sauces melt in your mouth. My husband and I both had the ribeye. His was a little too fatty for the price but the flavor was so good and it they were cooked perfectly. We will definitely be back for date night. This is a tough one. After the meal I did some research; I came to learn about Tiburon; to me this explains the expertise with the food. I mean you really hit it out of the park! The food is just top notch; it rivals fine dining in SLC like Bambara does! The quality of food meets price point. Ambience, setting, atmosphere falls short. At $45 a plate, we need more. I am guessing you have to juggle your amazing food, being right outside a movie theater, and a Wasatch Grill across the lane. A real tough one huh? I gently suggest a trial period with table cloths to hide the very "diner" type tables and chairs; they just do not do the food proper structure. A little polishing here is needed in my opinion. Best wishes, we will be back, but not until we try Epic first. Gob bless you all. Service was very slow, server forgot about us several times. I had the tenderloin, and it was a little below-standard for $38, sort of grainy and not seared very well. The rest of the food was very good. From the reviews, we expected more. We were there to celebrate our anniversary and wished we had just gone to Ruth’s Chris. My husband said his steak was the quality of sizzler. Excellent food and service. I had the Rib-eye and the Rare was actually done rare and not med-rare. The Caesar salad was one of the best I have had! So happy to have found this gem. We absolutely love this place. Not only for food and wine but the atmosphere is perfect to actually spend time with each other and be able to hear each other without yelling. Dinner was amazing. The courses are very well timed so you can relax with conversation without being constantly interrupted. The staff seems to work as a very good team. Overall it was a great dinner. If you love Beef Wellington, you'll love this side note to complement their fantastic choices of steak. You have to try it! Great dinner! Everything was perfect. Best dinner we have had at a more expensive restaurant. Thank you for making our day special! The food was not worth the price. The furniture was so cheap for a steak house. It’s was very expensive for the quality & amount of food..
We had a fabulous meal at Hoof & Vine. Started with shrimp cocktails, delicious. For mains, 3 of us ordered beef and all were tender and cooked to perfection. I ordered the seared Ahi and loved it. Salads and funeral potatoes were outstanding. Calle our server was attentive and very nice. We'd return in a heartbeat. Delicious steaks and a large wine list. Higher priced, but quality food and atmosphere. Great steak house. Probably the best place for steak in Sandy area. Chocolate cheesecake for dessert was awesome as well. Food and service was amazing.. But the restaurant seemed just thrown together. Some of the windows had air blowing through them as they where not sealed correctly. Need something to keep warm or dress for the outside. Unfortunately, Hoof & Vine has gone down in service and quality just like Tiburon. I was extremely disappointed with the service I had on New Year's eve. The food quality was good not great. 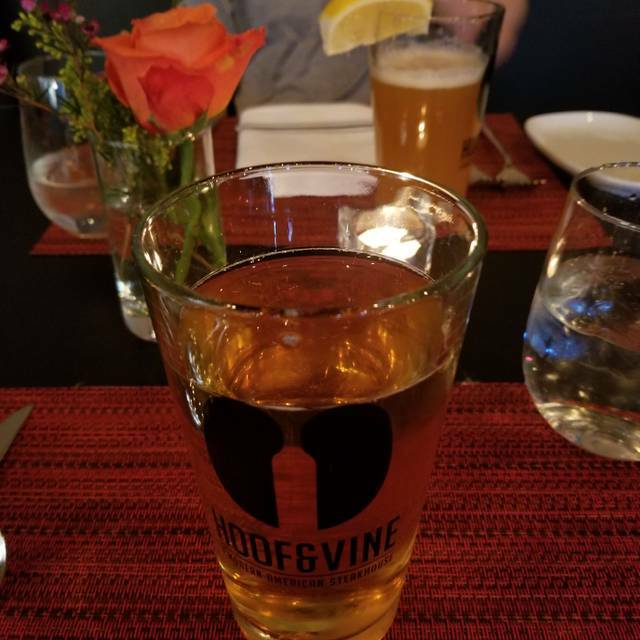 I've been to Hoof & Vine previous times and the food was amazing. We got there early and had great service and really great food.